Situated at the southeastern tip of the Korean peninsula, Busan Port (north latitude 35° 04′ 42", east longitude 129° 01′ 01"), serves as a major gateway connecting the Pacific Ocean and Eurasian continents. It is the primary port in Korea and the world's 5th largest container port (as of 2013). Busan Port benefits from optimal conditions that make it a world-class port, such as the shelter provided by surrounding mountains and islets, its relatively narrow tidal range and its ideal location adjacent to 3 major arterial sea routes. Busan Port currently has 30.7 kilometers of quay walls which can accommodate up to 201 vessels, and loading and unloading capacity for over 300 million tons of cargo each year. As the volume of the cargo containers passing through Busan Port steadily increases each year, the city is now working on a project to build Busan New Port, capable of berthing a total of 45 vessels (40 container berths and 5 multi-purpose berths) simultaneously and an annual handling capacity of 23million TEU. 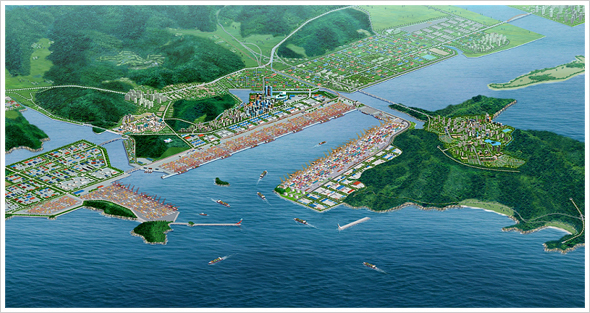 The city plans to complete the Busan New Port by 2020. Busan New Port now has a total of 22 berths. Managing company PNIT PNC Hanjin New Port Company Terminal (HJNC) Hyundai Pusan New-Port Terminal Co., Ltd. BNCT Inc.